among other things, about how the ISS uses solar power to generate its energy. Well, as it turns out, the ISS is far from the only spacecraft up there using solar power. John Scott, a mission planner for Chandra's Flight Operation Team, describes how NASA's premier X-ray observatory is as green as can be. Read more about Is it Easy Being Green? On Friday, April 3rd, the public will have a chance to get an inside peek at how the Chandra X-ray Observatory is run. 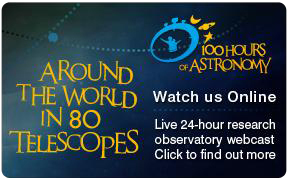 That's because we're participating in the "Around the World in 80 Telescopes" project that's part of the International Year of Astronomy's "100 Hours" program. You may have noticed that NASA is running an event mirroring the annual extravaganza that is the NCAA basketball tournament. 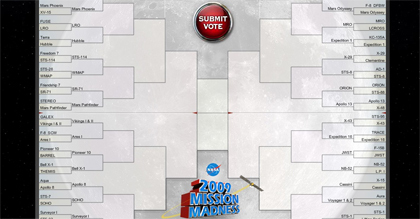 Instead of selecting the basketball teams you think will win (I'm rooting for a certain Big 10 team myself), you vote for your favorite NASA mission. We've talked about one of our favorite IYA2009 projects here before - "From Earth to the Universe" - and now we want to give you an update. As of this month, FETTU, as we lovingly call it, is a reality. In the US, FETTU is currently appearing in the Tucson international airport in the baggage claim area. This composite image of the Medusa galaxy (also known as NGC 4194) shows X-ray data from NASA's Chandra X-ray Observatory in blue and optical light from the Hubble Space Telescope in orange. Located above the center of the galaxy and seen in the optical data, the "hair" of the Medusa -- made of snakes in the Greek myth -- is a tidal tail formed by a collision between galaxies. The bright X-ray source found towards the left side of Medusa's hair is a black hole. In the next installation of our new "Meet an Astronomer" series here on the Chandra blog, we introduce you to Dr. Peter Edmonds. Peter has been a part of our Education and Public Outreach group since 2003 and he has been an invaluable member of our team ever since. He helps find, track and develop the Chandra stories that we publicize, and he's instrumental in striking the right balance between scientific detail and public understanding.